[INSURANCE, NEUTRALITY, SHIPPING, SPANISH EMPIRE]. Archive of Evidence in Thompson and Bathurst v. Maryland Insurance Company and Thompson and Bathurst v. Phoenix Fire Insurance Company cases, 1821-1824. 28 documents, 41 pp., most 7¾ x 9¾ in. 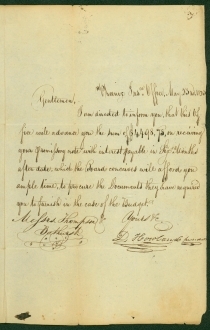 In October 1822, Baltimore merchants Hugh Thompson and Matthew Bathurst insured their ship Budget and its cargo for $5,000 with the Maryland Insurance Company and another $5,000 with the Phoenix Fire Insurance Company for a voyage from London, England, to two ports on the “Spanish Main” (Spanish colonies in Central America and on the northern coast of South America), then back to the United States. The Budget was transporting “munitions of war” from London to the blockaded port of La Guaira, Venezuela, on the coast ten miles north of Caracas, for Simón Bolívar’s rebels in Spanish America. On December 1, 1822, the Spanish privateer Cora, under the command of Captain Don Juan Esiga, captured the Budget and had it condemned as a prize of war at a court in Puerto Rico. The Budget’s captain, John Meany, purchased the ship back, billing Thompson and Bathurst for doing so. The merchants applied for payment from their insurers in March, 1823. By May, Thompson and Bathurst had turned over the Budget and its cargo to the Maryland Insurance Company and demanded payment. The insurers demanded more documentation, especially of the condemnation proceedings in Puerto Rico. In August, the insurance companies returned the copies of the proceedings in Puerto Rico to the ship’s owners “to be translated into English.” In March 1824, the insurers denied the claims. On March 17, 1824, the merchants sued the insurance companies in the Baltimore County Court for having “broken their covenant.” Chief Judge Stevenson Archer ruled in favor of Thompson and Bathurst. However, both the plaintiffs and the defendant’s objected to parts of the decisions and filed cross-appeals to the Court of Appeals of Maryland. Also, the original order in Spanish, December 23, 1822, with a certification by Judah Lord, “Commercial Agent of the United States of America for Port Rico,” January 2, 1823. 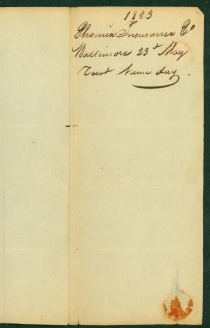 “The board of Directors have instructed me to inform you, that they do not consider the Company answerable for the claim you make for the ship Budget & freight, insured by policy No 8881, this opinion they have formed from advice given by Mr Wirt & Mr Purviance, who have had the case under their consideration. Matthew Bathurst (1778-1847) and Hugh Thompson (1760-1826) were partners in a general mercantile business in Baltimore, Maryland. John Meany (1770-1841) was a sea captain in the merchant service and then a merchant and ship-owner in Philadelphia. For many years, Hugh Thompson employed him. John Hollins (1760-1827) was a banker in Liverpool before immigrating to Baltimore, where he became a successful merchant. He was president of the Maryland Insurance Company from 1802 to 1827, and he held a variety of local offices. Simón Bolívar (1783-1830) was born in Caracas and educated in Spain and France. He joined the group of patriots that seized Caracas in 1810 and proclaimed independence from Spain. He went to Great Britain in search of aid but could get only a promise of British neutrality. When he returned to Venezuela, and took command of a patriot army, he recaptured Caracas in 1813 from the Spaniards. The Spaniards forced Bolívar to retreat from Venezuela to New Granada (now Colombia), also at war with Spain. He took command of a Colombian force and captured Bogota in 1814. The patriots, however, lacked men and supplies, and new defeats led Bolívar to flee to Jamaica. In Haiti he gathered a force that landed in Venezuela in 1816, and took Angostura (now Ciudad Bolívar). He also became dictator there. Bolívar marched into New Granada in 1819. His forces decisively defeated the Spaniards at Boyacá in 1819, liberating the territory of Colombia. He then returned to Angostura and led the congress that organized the original republic of Colombia (now Ecuador, Colombia, Panama, and Venezuela). Bolívar became its first president on December 17, 1819. Bolívar crushed the Spanish army at Carabobo in Venezuela on June 24, 1821. Next, he marched into Ecuador and added that territory to the new Colombian republic. After meeting with another great liberator José de San Martin in 1822, Bolívar became dictator of Peru in February 1824. His army won a victory over the Spaniards at Ayacucho in December 1824. Upper Peru became a separate state, named Bolivia in Bolívar’s honor, in 1825. He stepped down as president of Gran Colombia in January 1830 and died of tuberculosis eleven months later. The Maryland Insurance Company and Phoenix Fire Insurance Company v. Bathurst, Surviving Partner of Thompson, 5 Gill and Johnson (Maryland) 159-239.